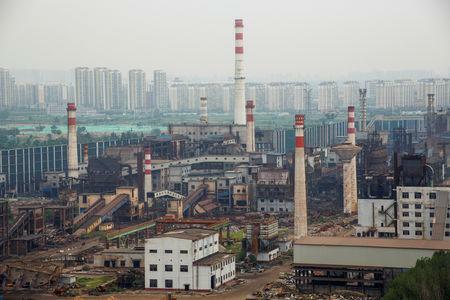 TANGSHAN, China (Reuters) - "Push the steel mills out of the city centre and turn it into a modern, habitable place to live in," reads a banner hung across the boarded-up offices of Guofeng Iron and Steel Co in the centre of Tangshan, China's top steelmaking city. Behind the gates of the factory, surrounded by a hospital, a shopping mall and high-rise apartment blocks, workers and bulldozers were busy on a recent visit tearing down furnaces as part of a 38 billion yuan (4.26 billion pounds)plan to move to a new industrial park 60 kilometres (37 miles) away. "It could be a problem because environmental management and regulatory oversight in the south are weaker than in the north," said Ma Jun, director at Institute of Public & Environmental Affairs (IPE), a Beijing-based non-profit organisation.